After an interesting bus ride, we finally arrived at the glacier! The driver told us that we had about 20 minutes to explore the glacier and we should go back to the bus station riding the same Ice Explorer that we came in. Unfortunately, we didn’t really pay attention to the time we spent on the glacier and we missed our Ice Explorer bus! Luckily, we found another Ice Explorer that took us back safely. 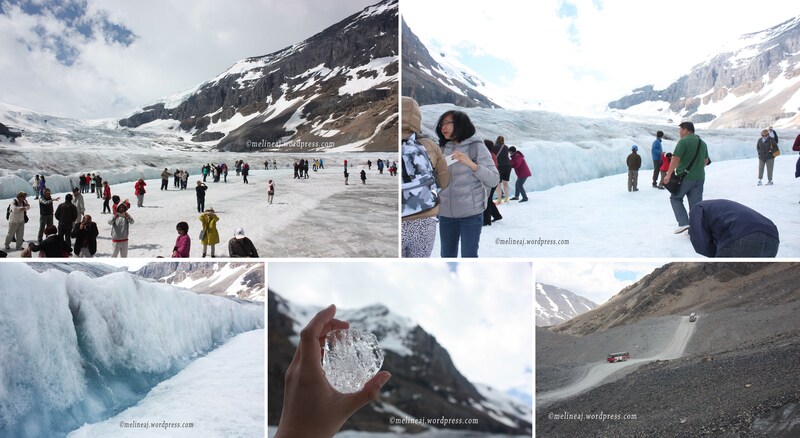 I know that the glacier is the most popular attraction since most of the tour agents always bring the tourists here, but honestly, paying a hefty $50 but 20 minutes tour is NOT enough! As I mentioned earlier, we were supposed to go back to the shuttle station using the same Ice Explorer bus but we missed it. So, we rode another Ice Explorer down to the station. On the way down, the driver shared more information about the glacier and its area. This area actually consists of 2 different zones: sub-alpine and alpine. If you see my picture below at the very left, you can see the division of the zone. The sub-alpine zone is greener because of the moss and pines, while the alpine zone has nothing that can grow in this area due to extreme temperature change during day and night. The driver mentioned that the pine trees around the area are actually 300-700 years old. However, their figures are so skinny, unlike the big & tall pine tree at my backyard. The reason for this is that the trees only have about 60 days per year to grow. This figure is known as ‘flagging’ (tree with one main skinny branch) since the moraine (the melted glacier mixed with gravel) will break any side branches on the trees. The Sunwapta Lake near the discovery centre is actually a hot spring (not from the melting glacier). 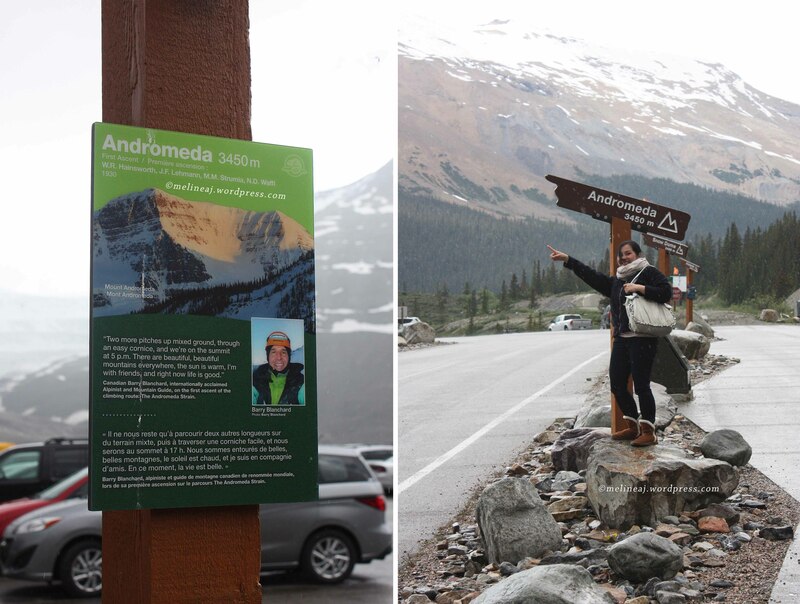 If you are curious for the name of the mountain around the Athabasca glacier, there are some signs with the mountain names near the parking lot. 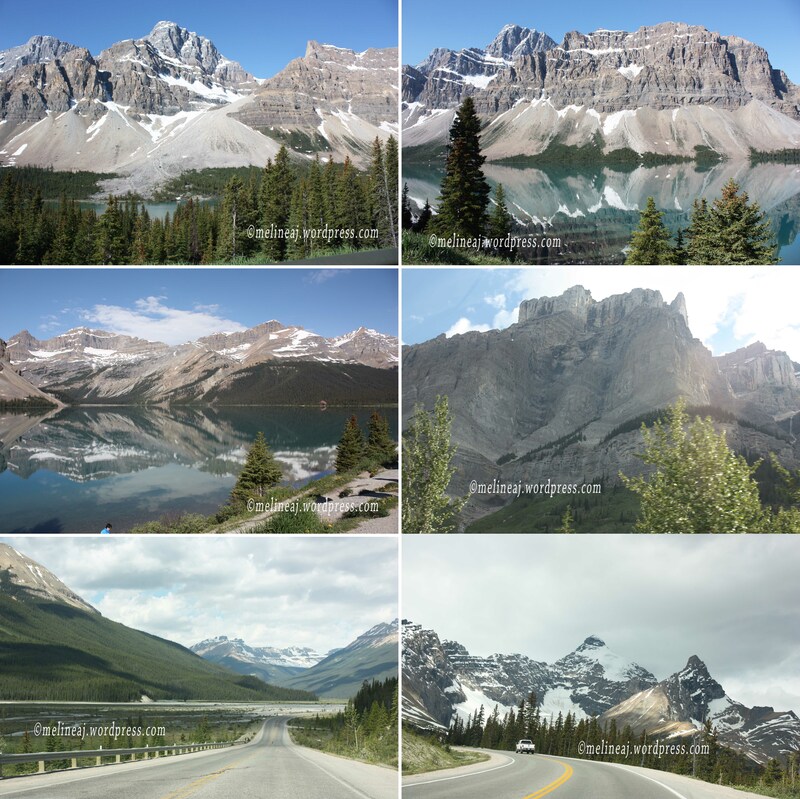 As I could remember, they are Nigel Mt., Athabasca Mt., Andromeda Mt., Snow Dome, and Kitchener Mt. And of course, I just had to take one picture in front of the Andromeda Mt. pole hehehe….. It was noon when we were back at the Discovery Center. We went up to the 2nd floor where the cafeteria is and boy, it was packed! There were a buffet restaurant and a cafetaria on this floor. The lunch buffet was pretty expensive (I believe it was around $22/person), so we opted to have lunch at the cafetaria. The line up for hot food service was pretty long but it moved pretty quick since the people in front of us were part of a tour. There are some options here, such as fish & chips, burger, some Chinese food, etc. The food was okay and it was a bit pricey – after all, it is a tourist destination area. After lunch, we continued to our Skywalk tour. Since we already had the ticket, we immediately line up for a shuttle bus going to the skywalk area. The short bus ride made me fall a sleep for a while hahaha… Yes, we were tired from the glacier adventure excitement 😛 Unlike the glacier adventure, you have unlimited time to explore the skywalk and there were lots of shuttle buses going back and forth to the Discovery Centre. The skywalk was just opened on May 1, 2014, so it’s basically a brand new attraction! The main star of this $21-million attraction is the glass platform that extends 30 metres over the Sunwapta Valley (ref). As we entered the skywalk, we were handed in a free audio guide. There are corresponding numbers around the attraction that you can punch in to the audio guide. The guide provides some interesting information and story about the construction of the skywalk as well as the area around. There are 400 meters of path leading to the skywalk where we took a bunch of picture with the Rockies as the background. There are also a lot of interactive information, such as the flora and fauna in the Rockies, the fossils found in the area, the formation of the valley from glacier, etc. 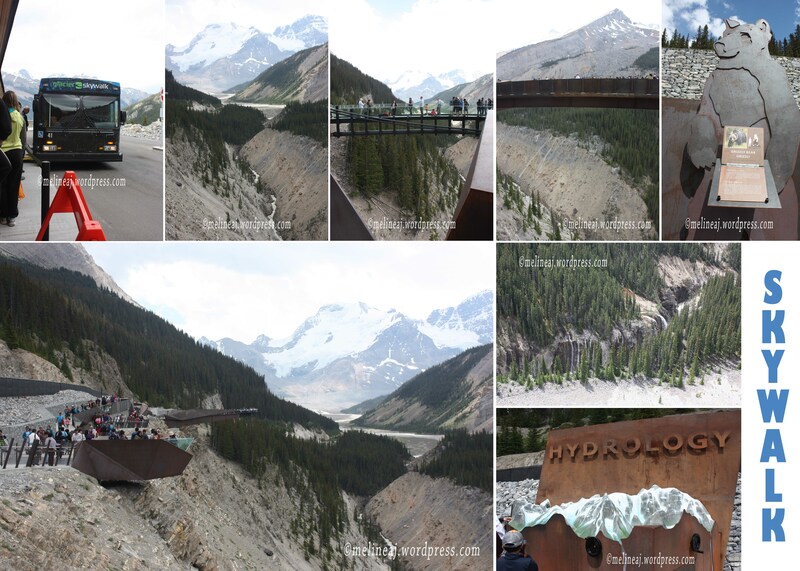 From the audio guide, we were told that the Skywalk is built on a previously disturbed land to avoid any environmental problem and it is fully endorsed by Parks Canada in 2012 (ref). The steel used in the skywalk was not painted to avoid any toxic run off for the environment, so it is left at its natural rusty colour. We spend a good hour to explore and took picture and as we waited for the shuttle bus back to Discovery Centre, it began to rain! Lucky us! When we arrived at the Discovery Centre, it was raining hard, so we decided to end our visit and drive back to Banff downtown. On the way back, I wanted to visit Peyto Lake since some website recommended to visit this beautiful turquoise lake. When we arrived there, the car parking lot was at the lower side while the lake is actually on the upper side so that we had to take a little hike. Since we were both tired and it was a bit drizzly, we decided not to see the lake. When we were about to go, I saw a sign for “Observatory.” I thought it is an indoor observatory tower so we decided to go up the spiral staircase (there is an elevator too). However, the observatory is actually outdoor! Luckily, it wasn’t pouring rain but still a bit drizzly. Again, the view is breathtaking! You can see 360° view of Rocky mountains as well as the walkway leading to Sanson’s Peak from here. When the rain stopped, we saw a huge rainbow. Never in my life, I saw a huge full rainbow and I was super excited! Not long after that, a second rainbow appeared but this time, they were only half rainbows 😛 Anyhow, it really made my day! Although the rain had stopped when we went back down to the station, we decided not to walk all the way to Sanson’s Peak since we were pretty tired. So, we rode down by the gondola. Don’t forget to take picture of the Starbucks café near the entrance. It is claimed to be the highest Starbucks throughout Canada 😛 We had dinner at Pad Thai restaurant at downtown before going back to the hotel. The rainbow from the observatory – it was actually a double rainbow!